Will there be more Bulls finalists for the Hall of Fame? Will there be more Chicago Bulls connections this weekend when the Naismith 2013 Basketball Hall of Fame finalists are revealed during All-Star weekend? The class of inductees will be announced during the NCAA Final Four weekend. This year there are four on the list with Chicago ties. Do they deserve it? Let&apos;s take a closer look at each contender. Younger Bulls fans think of the late John Kerr and his broadcasting days with the team. His passion for the team was infectious and endeared him to the local listeners on radio and television. His credentials on the court and the sidelines should give him a place in the Hall. This Chicago native began his career at Tilden High School, then played at the University of Illinois. With the Illini, his team won the 1952 Big Ten Championship and made the NCAA Final Four. Kerr was named to the school&apos;s "All-Century Team" in 2004. His NBA career began in 1954, he was the first selection (sixth overall) of the Syracuse Nationals. His team would win the NBA title that year. Kerr&apos;s NBA career took him to Philadelphia and Baltimore. In 1966, he was taken in the expansion draft to a new franchise: the Chicago Bulls. Instead of playing for his hometown team he would become its very first coach. Here is where John Kerr has a distinct NBA historical note: he is the only coach in the league to ever take a first year franchise (1966-67) to the playoffs. He was named "Coach of the Year" for the feat. Chicagoans remember him as an integral member of the Bulls coaching staff during championship seasons. There is much, much more to Bach&apos;s career. He has lived basketball his whole life and at the age of 88, still does as a Chicago resident. The Brooklyn native played guard in college at Fordham and Brown. He had a short tenure in the NBA and would make his name as a coach at Fordham and Penn State. Bach was the Golden State head coach from 1983-1986. After that stint he would join Doug Collins&apos; staff with the Bulls. He instilled the “Doberman defense” with the team, making it one of the best in the NBA. He left the Bulls and continued as an assistant with Charlotte, Detroit and Washington. He returned to the Bulls and finished his NBA career here in 2006. However, Bach continues to be active and assists with local high schools. There is no question he belongs in the Hall. This may be the most unpopular candidate on the ballot. But the Hall is for accomplishments for the sport, not off the court. My thoughts about Krause center on his role as the Bulls General Manager of a team that won six championships. For full disclosure, we did not get along. Heck, he didn&apos;t get along was most people. Players, coaches, staff and the media were always the enemy. To this day, when he comes to scout baseball games he bristles when you try to talk to him. However, Krause does deserve a spot in the Hall of Fame for the teams he built around the best player ever to lace up and play in the NBA: Michael Jordan. He also figured out the one coach who could harness and co-exist with Jordan: Phil Jackson. The Bulls fired Doug Collins, a popular coach, and Jackson was given the job. He was able to unload players and collected draft picks that brought in the pieces to surround Jordan. On draft day in 1987, he acquired Scottie Pippen in a deal and took Horace Grant in the first round (both starters). After several tries, he found the club’s starting point guard in a deal with San Antonio for John Paxson. His first top draft pick, Charles Oakley was swapped for New York’s veteran center Bill Cartwright. When Michael returned to the Bulls, Krause made a bold move that would insure more titles. He traded Will Perdue to San Antonio for Dennis Rodman. Rodman was a player that Bulls players and fans despised when he was a Piston. It worked. He also added Ron Harper, Luc Longley, Bill Wennington and Steve Kerr. What goes against Krause’s Hall of Fame candidacy is the perception that he ended the title run by breaking up the team. He also failed during the post-Jordan era. There is a huge anti-Krause sentiment fueled by Jordan. The Bulls owner is on the ballot for the first time. He purchased the team in 1985 and already had the Crown Jewel of the NBA in Jordan. He has been a model of consistency with his basketball franchise. They are now the third most valuable team in the league at an estimated $800 million. Reinsdorf is second to LA Lakers owner Jerry Buss with his six Championships. (Buss has ten.) With Blackhawks ownership, Reinsdorf was able to have a new stadium built. 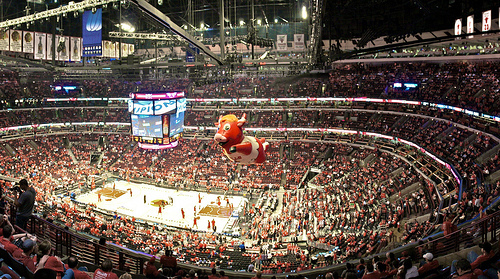 Even during the years after MJ retired and the team was dismantlesd the Bulls continued to sell out. Fans may not think of Jerry Reinsdorf as Hall of Fame material but the league will strongly consider him. Maybe not this year, but eventually.